In large resealable food storage plastic bag, combine buttermilk and Worcestershire sauce; mix well. Add chicken drumsticks; seal bag and turn to coat. Refrigerate 2 hours to marinate. In shallow bowl, combine 1 cup flour and seasoned salt; mix well. Remove chicken from buttermilk mixture. Coat chicken well with flour mixture. Discard buttermilk mixture and any remaining flour mixture. Heat 1/2 cup of the oil in large skillet over medium heat until oil begins to shimmer. Add half of the drumsticks; cook 8 to 10 minutes or until chicken is golden brown, fork-tender and its juices run clear, turning frequently. Remove chicken from skillet; cover to keep warm. Pour off any remaining oil. Repeat with remaining 1/2 cup oil and remaining drumsticks. Pour off and discard most of drippings, reserving 2 tablespoons drippings in skillet. Heat reserved drippings in skillet over medium heat until hot. Add 2 tablespoons flour, salt and pepper; cook and stir until bubbly. Stir in milk. Cook 2 to 3 minutes or until thickened, stirring constantly. 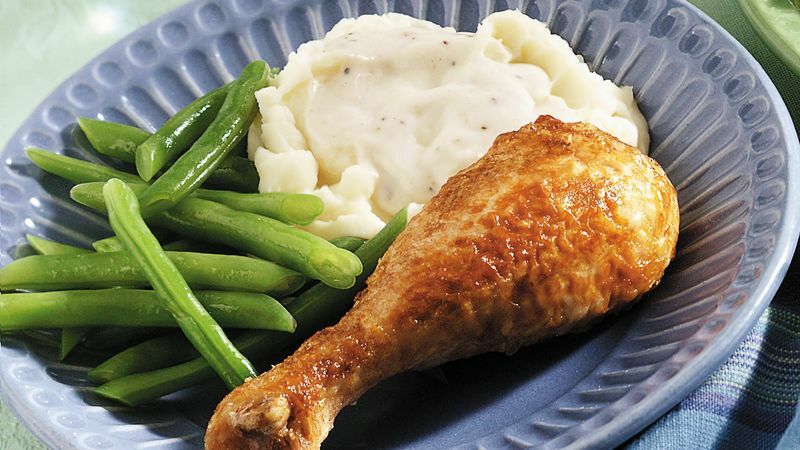 Serve gravy with chicken.